We posted on Friday about a somewhat mysterious website and press release that came out under the name Tax Billboard Act. Council member Abbe Land wasted no time in putting out word that this appeared to be a “trojan horse” for ulterior motives… namely to be able to put up signs in locations where they currently have to go through an approval and permitting process. Quite a bit more info and controversy surfaced today about it. The biggest news was about who was behind it… and that would be a guy named Mike McNeilly of SkyTag, according to Curbed LA. Council member Jeff Prang also put out a “voter alert” today warning people to be careful about what they were signing if they were presented with a petition on the subject. This "postcard" type graphic appears on the Tax Billboard Act website, which is backed by SkyTag, a company in the in the business of covering buildings with massive advertising images. “It would basically allow unregulated placement of billboards and tall walls on some of the City’s main thoroughfares without any local control or authority,” said council member Jeff Prang in his voter alert message. But forget about the details for a moment. Let’s just say that there seems to be something fishy about a website that appears to be against billboards, tall walls and supergraphics that is sponsored by someone with a direct interest in that industry. The website has quite a few graphics that seem to portray billboards as a blight, and calling for a tax on the industry on top of it all seems like it would lead a reasonable person to conclude that it is putting forward an anti-billboard campaign. An anti-billboard campaign seems to be the exact opposite of what is going on here. Since the campaign is sponsored by a company or person with a vested interest in that industry, it seems logical to conclude that the campaign isn’t in any way anti-billboard (or other form of outdoor advertising). But is that really a forthright statement? What isn’t being said here? Is this something about the definition of “billboard” vs. other type of sign? In the post over at Curbed LA with updated information today, McNeilly sure sounds like he is talking about signs being posted where there are no signs now. Frankly, we’re neither pro-billboard or anti-billboard (using that term broadly to cover the outdoor advertising industry). Billboards and outdoor signs can be cool and exciting, such as up on the Sunset Strip. Perhaps the “tall walls” that SkyTag is known for are even better alternatives to the traditional rectangular billboards around town, but that’s beside the point. What isn’t is that it is troubling (perhaps even insulting) to be presented with a “campaign” that isn’t what it seems… or at the very least, isn’t very good at communicating frankly about what it is up to, who is behind it, and what they are getting out of it. So far, this Tax Billboard Act simply stinks on the basis of how the proposal was presented to the public. If this is such a great idea, why hasn’t the City put it forward, or anti-billboard activists? It seems like a bad idea to let the billboard industry dictate their own terms, and for the City to lose the leverage of approving or denying their requests in dealing with them. Based on the way this has been presented to the public, without being completely up front about who is behind it and why, it seems like an especially bad idea. If the City has left money on the table in the form of a tax, that should be investigated. If that needs to be rectified, then surely there are ways to do so without giving up control on where these signs and billboards can be placed. That is the most valuable leverage that the people, via our elected representatives, have in our dealings with the companies. Giving this up would seem to make poor business sense in any strategy textbook. Darin Weeks is the Publisher of Weho Daily. He holds a B.S. in Economics from the Wharton School of the University of Pennsylvania, with concentrations in Strategic Management and Electronic Commerce. 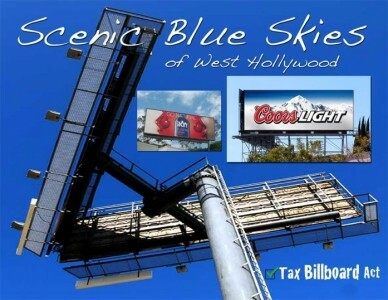 To clarify the facts about the Tax Billboard Act and the “trojan horse”, which sounds more like a ride the billboard companies want the media to take to divert the publics attention from the very real positive financial impact this Initiative will have for West Hollywood. In fairness, billboard companies should be required to give back a fair share of these revenues to the community through the “Tax Billboard Act” Initiative. Billboard Millions vs The Peoples Pennies. There is only one fair side to this issue and that is the side of the People of West Hollywood. You say that the trojan horse is something the BILLBOARD companies are putting forward to the media? Isn’t it a concept put out by the City of West Hollywood as part of an argument against the billboard companies? Statements such as this only make me more skeptical of the campaign. I’m a bit confused, but it sounds like a quid pro quo proposal: The City makes more revenue (taxes) from the ad companies in exchange for fewer restrictions upon the placement and size of billboards. Am I understanding this correctly? Brian, if that is the proposal, then that should be what is proposed clearly in the initiative, rather than trying to hide that part. But even that argument has problems. The website and press releases, and even the comments posted in favor of the initiative on this website, make a strong case that West Hollywood simply deserves to be compensated based on the existing billboards and having to live with them… without making a case for the trade off. As such, the tax revenue should come without having to loosen the restrictions on placement. Additional revenue might then come directly from those installations that are granted special permission outside of the existing rules and permitted signs. Further, an across-the-board tax on all outdoor advertising in the city seems like an unfair way to shift the costs of the benefits received by a few companies and property owners to the rest of the signs placed throughout the city. That would almost certainly cut into the revenue of a property owner on Holloway and La Cienega but instead only benefit a sign and property owner, say, perhaps on Beverly.